Whatever your moving needs may be, Meathead Movers will help you feel at home. Our professionally trained student-athlete Carson movers and our moving concierge will be with you for the entirety of your move to Carson. Whether you’re moving to Carson to enjoy everything the LA area has to offer or are moving to take a new job, you’ll want to check out the most trusted Carson movers from Meathead Movers. Located in the heart of LA county near both downtown Los Angeles and the Los Angeles International Airport, Carson has many benefits for the people who decide to call this city home. Not only does this area benefit from the presence of California State University, Dominguez Hills, but it also hosts the Major League Soccer team L.A. Galaxy at the Home Depot Center. Several large corporations also have significant presences, including BP Global and Northrop Grumman. The city’s ideal Los Angeles location means that you can easily explore Los Angeles county. If you are researching Carson movers, Meathead Movers is here to help! You’ll find several movers out there, but none with our dedication to quality and customer service. In fact, we’re the only moving company in California to offer a 100% satisfaction guarantee. One of the main draws of Meathead Movers is the quality of help that we hire. All our clean-cut student-athlete movers are thoroughly screened and trained before their first move. Our movers will also show you our trademark Meathead hustle: when our movers aren’t packing or loading boxes into the truck, they’ll jog to where they need to be next in order to save you valuable time and money. At Meathead Movers, we take care of the heavy lifting for you so you can focus on settling into your new home. With branches not just in LA, but all throughout California, we are your one-stop resource for all your moving needs, no matter where your California move takes you. Our Carson moving company specializes in local, long-distance, and commercial moves to, from, and within the state. We also provide reliable packing, storage, on-site relocations, and our distinctive moving concierge service, which can connect you with trusted service providers in your new area. 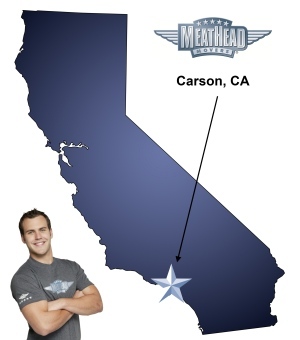 Moving to Carson doesn’t need to be stressful, especially if you choose Carson movers from Meathead Movers. Call us today to learn even more about our services, including our support services, our concierge service and our packing service. We’ll even give you a free, no-obligation moving estimate. Moving to Carson? Here are some helpful resources. 530 E. Del Amo Blvd. good communication with office and movers. Excellent service. This was the easiest move I've had in my life. Josh and Anthony were really fast and friendly, and they moved some furniture that was on the fragile side with ease. I will definitely use Meathead for my next move. Excellent communication leading up to pick-up date and on pick-up date. On time for pick-up. Professional and courteous.